A Soyuz spacecraft carrying two Russian cosmonauts and an American spaceflyer has landed safely back on Earth, wrapping up a four-month mission to the International Space Station. A Soyuz space capsule carrying Russian cosmonauts Gennady Padalka, Sergei Revin and NASA astronaut Joe Acaba landed on the Central Asian steppes of Kazakhstan at 10:53 p.m. EDT Sunday (0253 GMT Monday), where the local time was early Monday morning. NASA spokesman Rob Navias of the Johnson Space Center called the touchdown a "bull's-eye landing." 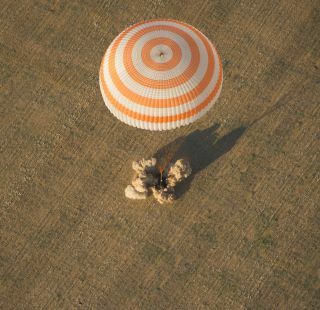 The Soyuz TMA-04M spacecraft landed under a clear blue sky and touched down in a wheat field, with Russian recovery crews swiftly extracting the three spaceflyers from the capsule. NASA spokesman Josh Byerly, who was on hand at the landing, said the Soyuz crew was in good health and spirits, with Acaba enjoying his return home. Now that they're back on terra firma, Acaba, Padalka and Revin may begin to reflect on a spaceflight experience filled with memorable and dramatic moments. Their 125-day spaceflight began in mid-May and included three spacewalks and several robotic cargo ship arrivals. The drama started before they even left the ground. The three spaceflyers were originally slated to blast off in March, but a pressure test incident cracked their first Soyuz capsule, causing a six-week delay while another spacecraft was readied. The trio finally launched on May 14 and arrived at the $100 billion orbiting lab May 17. Just eight days later, SpaceX's robotic Dragon capsule docked with the station on a historic demonstration mission, becoming the first private vehicle ever to do so. Dragon is likely to make the first of 12 contracted cargo runs to the orbital outpost for NASA next month, space agency officials have said. Toward the end of the three astronauts' stay, on Sept. 5, crewmates Sunita Williams and Akihiko Hoshide performed an extra spacewalk — the third for the mission — to replace a vital power unit on the station's backbone-like truss. Using improvised tools such as spare parts and a toothbrush, Williams and Hoshide defeated a stuck bolt that had delayed the fix a week earlier. "Looks like you guys just fixed the station," astronaut Jack Fischer told the station crew that day from Mission Control at NASA's Johnson Space Center in Houston. "It's been like living on the set of Apollo 13 the past few days. NASA does impossible pretty darn well, so congratulations to the whole team." The departure of Acaba, Padalka and Revin brought the 430-ton orbiting complex's Expedition 32 to an end. Padalka commanded the expedition, while Acaba and Revin served as flight engineers. Williams is now in charge of the new Expedition 33. She, Hoshide and cosmonaut Yuri Malenchenko will have the station to themselves until mid-October, when three more astronauts will float through the hatch and bring the expedition up to its full complement of six crewmembers. Tonight's landing wrapped up the first-ever spaceflight for Revin and the second for Acaba, who visited the station during the space shuttle Discovery's 13-day STS-119 mission in 2009. Padalka, on the other hand, is a veteran of several long-duration space station stays. He commanded the orbiting lab's Expedition 9 in 2004 and its Expedition 19 in 2009. Padalka also logged 198 days in orbit as commander of Expedition 26 aboard Russia's Mir space station from August 1998 to February 1999. With the Expedition 32 mission now complete, Padalka has a total of more than 700 days in space, placing him fourth on the list of people who have spent the most time in space.